1Laboratory of Analytical Chemistry. Center of Development and Drugs Research (CIDEM). Ave 26 # 1605, Havana, Cuba. 2Pharmacy and Food Institute. University of Havana. Ave 23 # 21425, Havana, Cuba. 3Natural Products & Food - Research and Analysis, Department of Pharmaceutical Sciences, University of Antwerp, Universiteitsplein 1, 2610 Antwerp, Belgium. Se validó un método cromatográfico para la determinación de Mangiferina en muestras cubanas obtenidas de hojas de Mangiferina indica. Se empleó una columna GraceSmart RP -18 (150 mm x 4,6 mm i.d., 5μm particle size) y una fase móvil de dihidrógeno ortofosfato de potasio (0,01 M) pH 2,7 ± 0,2 - acetonitrilo (85:15, v/v) con un flujo de 1,0 mL/min y una detección UV a 254 nm. El método validado fue comparado con el método establecido para el control de la calidad de las muestras cubanas de mangiferina, mediante la prueba de Student. En el estudio de validación fueron evaluados los parámetros: especificidad, precisión (repetibilidad, precisión intermedia y reproducibilidad), exactitud, linealidad, robustez y límites de cuantificación y detección. Se demostró que el procedimiento desarrollado, fue lo suficientemente lineal, con un límite de detección de 10 % y 30 % como límite de cuantificación, específico, preciso, exacto y robusto para la determinación del contenido de mangiferina en las muestras cubanas. Los resultados obtenidos en el proceso de validación demostraron a través de pruebas documentales la confiabilidad del método cromatográfico; Además no se observaron diferencias significativas entre los métodos evaluados, el método validado puedo aplicarse en el control de la calidad de las muestras cubanas. El método usado en la cuantificación de mangiferina resultó específico, lineal, preciso, exacto y robusto y puede ser empleado en el control de la calidad y estudio de estabilidad. 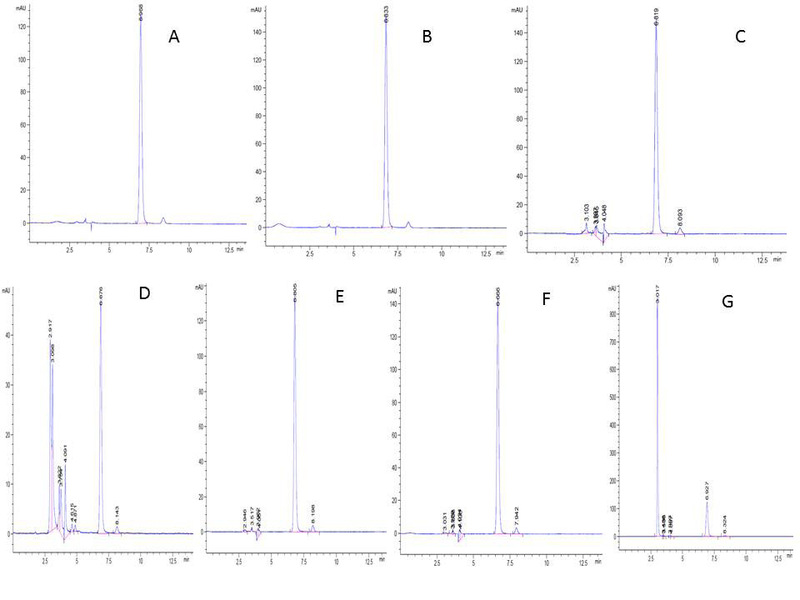 The purpose of this study was to validate, in accordance with international standards, a chromatographic method to determine the mangiferin in Cuban’s samples, obtained from Mangifera indica leaves. A GraceSmart RP -18 (150 mm x 4,6 mm i.d., 5μm particle size) column and mobile phase of potassium dihydrogen orthophosphate (0.01 M) pH 2.7 ± 0.2 - acetonitrile (85:15, v/v) with the flow rate of 1,0 mL/min and UV detection at 254 nm wavelength is used. The validated method was compared with the established method for the quality control of the Cuban’s mangiferin samples, through the Student test. In the validation study the parameters were evaluated: specificity, precision (repeatability, intermediate precision and reproducibility), accuracy, linearity, robustness and detection and quantification limits. It was demonstrated that the developed procedure, was the sufficiently lineal thing, with a detection limit of 10 % and 30 % like quantification limit, specific, precise, exact and robust for the determination of mangiferin content in the Cuban’s samples. The results obtained from the validation process provided documentary evidence of the reliability of the chromatographic method; In addition, no significant differences were observed between the chromatographic methods evaluated, so that the validated method can be applied in the quality control of the Cuban’s samples. The method used in the quantification of mangiferin was was specific, lineal, precise, exact and robust, for quality control and stability study. Mango (Mangifera indica L.) is one of the most important tropical fruits worldwide in terms of production and consumer acceptance1. This plant contains important constituents, such as proteins, saponins, tannins, carbohydrates, terpenoids, mucilage and glycosides. Among the various polyphenolic compounds found in the mango2, mangiferin (C-2-β-D-glucopyranosyl-1,3,6,7-tetrahydroxyxanthone, also named C-glucosyl xanthone) is a distinct one (figure 1). It’s considered a heat-stable molecule and a natural pharmacologically active phytochemical that was found to have various bioactivities, such as antioxidant, antitumor, antipyretic, neuroprotective and inmunomodulatory3) (4) (5) (6) (7, and other effects. Because of this, it is considered a potent active pharmaceutical ingredient of natural origin, for the development of pharmaceutical formulations. The method established for the quality control of the active pharmaceutical ingredient magiferin (MgF), in Cuba, employs gradient, we proposed as objective in the present work to make modifications in the chromatographic conditions of the analytical method, with the aim of optimizing the resources available in our center. It will also facilitate a reduction for the liberation of the lots for the elution of the mangiferin at the same time of smaller retention, decrease of the costs for concept of employment of reagents. When variations are made in analytical methods, it is necessary to perform the validation of the same, in order to obtain documentary evidence of the safety and reliability of the results offered by the new method, set by the State Center for Drug Control (CECMED), Cuba8. It is also necessary to make statistical comparisons between the results obtained by both methods to demonstrate if there are significant differences between the results obtained. Mangiferin standard was donated by the Center of Pharmaceutical Chemistry and certified by the CECMED, the HPLC purity of the reference material was 93.8%. The sample was obtained in the same center. The reagents used were of analytical grade (MERCK, Germany). In table 1, we report the chromatographic conditions of each method, the established and the new. The buffer solutions were prepared by dissolving 1.36 g of potassium dihydrogen orthophosphate in 900mL of water, and the pH was adjusted to 2.7 ± 0.2 using dilute orthophosphoric acid. Finally, the volume was made up to 1000 mL with distilled water9. While the 0.2% acetic acid solution was prepared by taking 2 mL of acetic acid in 1000 mL of distilled water. To construct the calibration curve, a stock solution of 100 ppm of reference compound MgF was prepared in a 50% dioxane solution. A series of dilutions were subsequently carried out to obtain 1/2, 1/4, 1/8, 1/16 and 1/32, of the original concentration for the preparation of standard solutions in distilled water10. About 10 mg of Cuban’s sample MgF were accurately weighed, transferred to a 100 mL volumetric flask, and made up to volume with a mixture of dioxane: water (1:1) v/v. A 4 mL aliquot was transferred to a 25 mL volumetric flask and made up to volume with the same mixture. In order to evaluate the specificity of the method, the chemical reference substance and the MgF Cuban’s sample and samples subjected to drastic conditions such as acid hydrolysis (HCL 1N), basic hydrolysis (1N NaOH), oxidation (H2O2), light and temperature (70oC). The test samples remained degraded for 7 days. Criteria: No signs of degradation products should be obtained in the circumvention zone of the active ingredient8), (11) (12) (13) (14. The accuracy of the method was evaluated through the repeatability, intermediate precision and reproducibility studies. Repeatability was studied based on six determinations. The mean values, the standard deviation and the coefficient of variation were determined. The intermediate precision study involved two analysts, two different days, in the same laboratory. While the reproducibility studies were carried out in two different centers, in different countries, Cuba and Belgium. Six replicates were analyzed in each case of samples equivalent to 100%. The Fisher test was used to determine if there were significant differences between the results of the analysts who used the same method and between the days on which the analyzes were performed. The Student t test was used to verify if the mean values obtained between the analysts, who used the same method, and the two days on which the analyzes were performed, were homogeneous, at a 95% confidence level. Criteria: Repeatability: CV ≤ 2.0 % and RSD ≤ 3.9 %. Intermediate accuracy (calculated t must be less t tabulated, calculated F must be less F tabulated), for a confidence level of 95 %8), (11)-(14. In the study of accuracy, the addition of a standard to a sample was used, adding increasing amounts of the same equivalent to 25, 50, 75 % of chemical reference substance. Criteria: mean recovery between 97.0 - 103.0%, the calculated G must be less than G tabulated for a 95% confidence level8), (11)-(14. In order to evaluate the linearity parameter, five solutions of known concentrations of the chemical reference substance corresponding to 2, 4, 8, 16 and 32 ppm were prepared. Three replicates were made for each of the five solutions prepared. Criteria: equation of the line (Y = bX + a); correlation coefficient (r ≥ 0.999); coefficient of determination (r2 ≥ 0.980); relative standard deviation of slope: Sb (rel) ≤ 2.0%; coefficient of variation of response factors: CVf ≤ 5.0%8), (11)-(14. The robustness of the developed method was evaluated carrying out variations under some conditions of the process: proportion of the column chromatographic and different flow determining if significant differences existed when being compared with the conditions of the proposed method8), (11)-(14. The detection limits (LOD) and quantification (LOQ) they were calculated using the expression: k x S.D/b, where k=3 for the LOD and 10 for the LOQ, being S.D: the standard deviation of the I intercept (or white) and b the slope of the calibration curve. For they were carried out it determinations to three inferior concentrations to the linealidad curve, carrying out the estimate of the answer of the target and the one intercepts from the equivalent curve to the standard deviation of the target8), (11)-(14. The chromatograms obtained from the results of the specificity study are shown in figure 2. As shown in table 2, all the results of the MgF percentage presented values very close to each other and in addition, there were no extreme concentration values very far from 100%. The results obtained in the analysis of the accuracy of the method are shown in table 3. As can be seen in table 4, the values of the regression and determination coefficients obtained were very close to the unit, and also higher than those established in Annex I of Good Laboratory Practices of CECMED, Cuba, 2013 . The value of the LOD was 10 % and that of the LOQ of 30 %. Experimentally they were checked these securities obtaining good results. In the Table 5 the results of the robustness study are shows, the values obtained from t-Student for each of the variables were lower than the tabulated value (2.20) demonstrating that there is no significant effect in the averages of values of the content of mangiferin against the changes studied. The results obtained by applying both methods were compared statistically using the Student test, the calculated statistician was 0.40. When purchasing this value with the tabulated (2.01) it was possible to appreciate that it meets the acceptance criteria previously established because the calculated t is less than the t tabulated for a 95% confidence. Figure 2: Specificity of the method. A- Reference substance. B- sample. Sample subjected to drastic conditions: C- acid hydrolysis. D- basic hydrolysis. E- oxidation. F- light. G- temperature. In the study of the specificity of the method, it is possible to observe the marked similarity between them as their retention times (tr) are the same for the chemical reference substance and for the MgF sample, respectively, analogous to each other. The chromatograms of samples subjected to stress conditions (C, D, E, F and G) suggest that the proposed procedure for the treatment of the samples was effective as evidences of the expected degradation of mangiferin were observed. These evidences were revealed from a significant decrease in the signal corresponding to MgF and the appearance of secondary peaks at other retention times. With the chromatograms C and D, it is shown that the peaks attributable to the degradation products of mangiferin, do not interfere in the determination of the IFA. This is because such degradation products do not elute at the same time as MgF. The results obtained evidenced the specificity of the method and the feasibility of its application in the quality control and stability study of the IFA8), (15)-(16. This gives the data analyzed a fairly symmetrical distribution that guarantees the use of the mean in this case as a measure of reliable central tendency. The coefficient of variation eliminates the dimensionality of the variables and takes into account the ratio between the mean and the standard deviation, for this reason is a measure of variability relative to the mean. With the obtained CVs it is guaranteed that the variability of the results take place within the established limits for the chromatographic methods CV ≤ 2.0%, which shows that the method evaluated has good precision8. Also, the relative standard deviation values obtained were within the limits established for chromatographic methods, whose limits in the active principle content are between 90.0 - 110.0% (≤ 3.9%)17. In the studies of intermediate precision and reproducibility, the values of the Fischer and Student tests calculated were smaller than the tabulated, for a 95% probability, demonstrating that there were no significant differences between the variances and the means obtained by both analysts, on different days, or in different laboratories. The set of these results allows to assure the precision of the chromatographic method studied, so it can be affirmed with certainty that the random errors do not have significant repercussion in the evaluated method8. The influence of the concentration factor on the variability of the precision results, when applying the Cochran test, we obtained that the calculated G was lower than the tabulated G for a probability of 0.05, k = 3 and n = 3. Therefore, the variations of the concentrations used are equivalent, which indicates that the concentration does not influence the variability of these. In the range selected in the accuracy study, the recovery percent values are within the limits established for the chromatographic methods (97.0 - 103.0%) and the values of the coefficient of variation, for each of the concentrations levels were less than 2.0%8. The value of the coefficient of determination (r2) of 0.998 indicates that the line of linear regression achieved efficiently describes the relationship between the variables studied since the linear model fits favorably with the experimental data. The coefficient of linear regression (r) of 0.999 shows the intensity that characterizes the relationship between X and Y. The values obtained from both coefficients allow to demonstrate the existence of an adequate correlation. The values of the coefficient of variation of the response factors (CVf) and the standard deviation of the slope of the regression line (Sb rel) are below the established limit values: 5.0 and 2.0% respectively. These statisticians are considered point estimators that allow the characterization of variability. The value obtained from the coefficient of variation of the response factors indicates that there is a favorable variability in the concentration / response ratio for each level evaluated8. The results obtained in this study demonstrate the linearity of the method by HPLC for MgF. It was demonstrated in the study of robustness that significant differences don’t exist among the securities averages with regard to the method proposed however, if variations are observed in the times of retention from the mangiferin when using different columns and different speeds of flow. For what the developed analytic method can be considered robust. For these reasons, it can be stated that the results obtained as part of the comparison between the two methods do not differ statistically, which shows that there are no significant differences between them. This study shows that the validated method can be applied indistinctly to the method established for the quality control of Cuban’s samples of MgF, since the results obtained with the use of both methods are similar. The validated method for the active pharmaceutical ingredient MgF can be applied in quality control because it is specific, precise and linear in the range of concentrations studied. Using the method of this new method, we obtain precise results that do not differ statistically from those obtained by the method established in the Chemical Analysis Laboratory of CIDEM, Cuba. We thank VLIR-UOS for support of this work.